« Join Denbighshire Archives for the project launch of ‘Unlocking the Asylum’. The collection of records from the North Wales Hospital held by Denbighshire Archives, represent one of the most comprehensive examples of asylum records in the Country. The collection includes administrative records such as annual reports and minutes, financial records such as annual accounts and ledgers, and a fascinating collection of patient records. Amongst the patient records one of the most detailed sources of information are the patient case books which provide rich details of individuals both before and during their time at the hospital. Under the Act for the Regulation of the Care and Treatment of Lunatics 1845 the keeping of patient case books became mandatory, rules and orders prescribing the format of these records were set forth by the Commissioners in Lunacy. Up until 1875 the case books used by the North Wales Hospital varied in the level of detail they contained about each patient, and the information collected about the patient’s condition prior to arrival was minimal. The 1873 annual report reveals that following the suicide of a female patient, the Committee of Visitors of the asylum realised the importance of recording the previous history of each patient and “ordered that all facts and particulars of the case of every patient should be entered by the Medical Officer in a book” (reference HD-1/4). The Commissioners in Lunacy approved a new case book form which came into operation at the asylum in 1875 and ensured the collection of detailed background information about each patient. From 1875 up until the formation of the National Health Service in 1948 the patient case books remained similar in the information they contained. 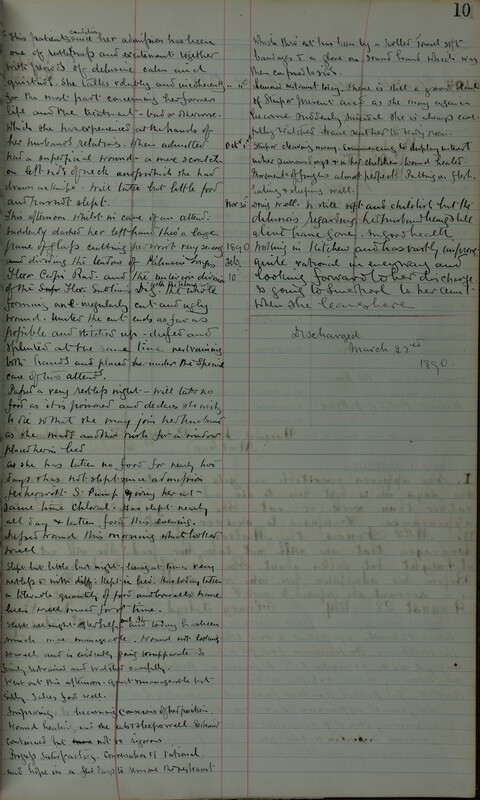 Each entry in the case book was split into two sections, the first contained personal and background information about each patient and an assessment of the mental state of the patient on arrival. If we look at one of the case notes (reference HD-1/337) as example, from this first section we can see that Margery Baynton lived in Denbigh. 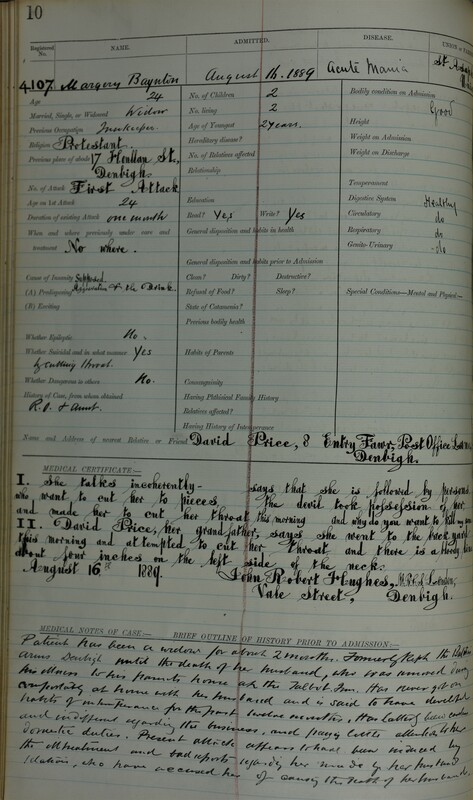 Previously an innkeeper she was just 24 years old when she was admitted to the asylum on 16th August 1889 with what was described as acute mania. The case notes reveal that Margery attempted to commit suicide, an assessment of her at the time found that she “says that she is followed by persons who want to cut her to pieces, the Devil took possession of her and made her cut her throat this morning”. The background information collected reveals that Margery had been recently widowed and left with two children. She was described as having “developed habits of intemperance”, and that the present attack was brought on “by the ill treatment and bad reports regarding her made by her husband’s relations, who have accused her of causing the death of her husband”. The second section of the case notes contain reports on the progress of the patients written at various intervals during their stay. During the first few days of her time at the asylum Margery attempted to injure herself, and would “take no food as it is poisonous and declares she wills to die so that she may join her husband”. On the 10th February 1890 Margery is described as “working in the kitchens and constantly improving. Quite rational in every way and looking forward to her discharge”. The notes reveal that Margery planned to go to Liverpool to live with her Aunt. 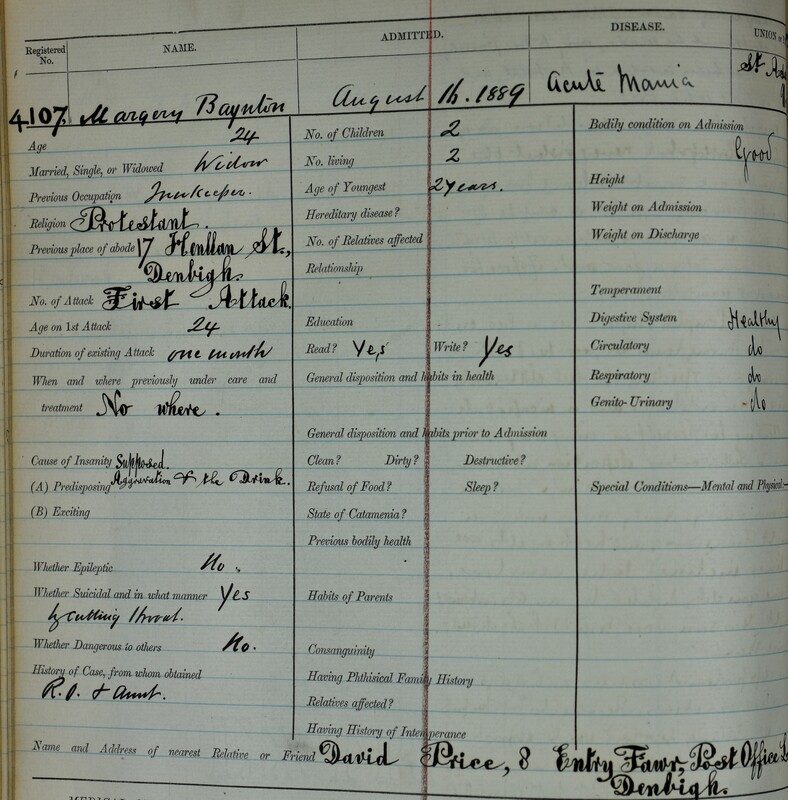 After just over six months in the asylum Margery was discharged. In addition to the wealth of information found in these two sections some case notes also include attachments such as a notice of death, and correspondence from relatives and medical practitioners. In order to protect the personal information given in these case books, all records which are less than 100 years old are closed due to NHS patient confidentiality regulations. This entry was posted on November 18, 2017 at 9:00 am and is filed under Uncategorized. You can follow any responses to this entry through the RSS 2.0 feed. You can leave a response, or trackback from your own site. Very interesting and fascinating look into the life of the patient and hospital itself. I agree with Amanda, fascinating. Thank you for sharing. Good luck with the project, look forward to hearing further updates!